Welcome to the Season’s Readings Happy Holiday Giveaway!!! On behalf of all the folks here at the Read ’Em and Eat café and bookstore in gorgeous Fort Myers Beach as well as Carmela, Ava and the gang from the New Orleans Scrapbooking Mysteries that our author co-writes with the marvelous Laura Childs, I’d like to offer you an opportunity to win any ONE of these five books: Well Read, Then Dead, Caught Read Handed or Read to Death from the Read ’Em and Eat series; or Parchment and Old Lace or Crepe Factor from the Scrapbooking series. For a chance to win the book of your choice, please comment below and tell us which book you would like to win. Don’t forget to include your email addy in this format: name(AT)server(DOT) com to avoid the spam bots. Giveaway closes at midnight, Thursday, December 22nd. And here is a note from our author: FYI: On Amazon the price of READ TO DEATH is reduced to $7.19, and WELL READ, THEN DEAD is reduced to $7.43. No reduction on CAUGHT READ-HANDED , who knows why? Whatever holiday you celebrate this season, we hope you have a joyous time. Great choices. I think Crepe Factor. Thanks for the chances and happy holidays. I love both authors (I've met Terrie). If I'm the lucky winner I'd like either Caught Red-Handed or Red to Death. I love this author team together and apart. Both styles are delightful and entertaining, and together they are wonderful afternoons of reading Merry Christmas! The Read Em and Eat series is wonderful! The scrapbooking series is new to me. Thanks for the chance. I would love to have Well Read, Then Dead. Thanks for the chance! I'd like Well Read, Then Dead since this is a new series for me. I love the scrapbook mysteries. mcastor07 (at) Gmail (dot) com. Well Read and Then Dead. Thank you for the giveaway. lady (dot) janel (at) hotmail (dot) com. I would love to read the first book of either series. I haven't read any of them yet. I love Laura Childs. But I would like to try Well Read Then Dead. one to complete my collection. I'd like to read Well Red Then Dead. So kind, Terrie!! Good luck to everyone! Happy reading. I would like to win Crepe Factor thank you for the chance. I'd like "Read to Death". Thanks for the chance. Good luck to everybody! I have the Read 'em and Eat books, so I would like to read "Parchment and Old Lace". Thanks for the chance. Merry Christmas! I would love to read book #1 Laura.milburn09@gmail.com. Thank you for the chance. I would like Well Read, Then Dead by Terri Moran. Sassy and Bridget would make a fun read. I also like books set in the South so Fort Myers, Florida works great. I've wanted to read Terri Moran for quite a while. Thank you for this opportunity. They all sound like they should be read by me but I think I would like to have Parchment and Old Lace please. Well Read Then Dead!☘ thanks for the chance! Well Read, Then Dead sound interesting. It is so terrific to see such interest in the Killer Character's Season's Readings Giveaways! I would like Caught Read-Handed, please. Thanks for the chance. Happy Holidays! I would really like to read Well Read, Then Dead. Such a clever title! Thank you for hosting this event! I'd like Parchment and Old Lace so I can share it with my cozy reading friends. Thank you! Wow this is so hard to choose I think I would like them all...but if I have to..then I haven't read Laura Childs so I would like Parchment and Old Lace...and I have been dying to read her...thank you so much for the chance. They all look awesome but I think I would like Parchment and Old Lace. Thanks for the chance to win. Great giveaway! Parchment and Old Lace. Thanks for the chance. Thank you for such a great giveaway! I would love a copy of Crepe Factor. Merry Christmas! I would love a copy of Crepe Factor. Merry Christmas! 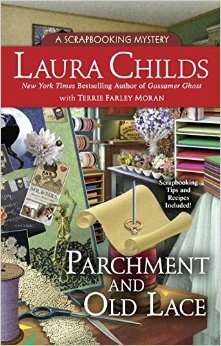 Would love the Laura Childs Parchment and old lace! Tonya Kappes sent me here. I haven't read any of your books! Im a cozy mystery fan. How did I miss you? Mary, I am happy to meet you! Thanks to Tonya for getting us together. Great books and all I have all 5 of them. So just stopping by the say "Thank You for your awesome books"
I would like to read Laura Childs Parchment and an Old Lace. Thank you for the giveaway! Merry Christmas and Happy New Year. Very hard choice but I'd like Read to Death. I love both authors! Merry Christmas! Hard to choose, but I will choose Well Read then Dead. Thank you for the giveaway. I think Crepe Factor sounds very entertaining. Thanks for the chance. I would chose Parchment and Old Lace. I would love to win read to death. Thanks for the chance to win. I would love to win Crepe Factor! Thanks for the chance! Merry Christmas! Such a hard decision to choose just one title to read. I would start from the first book, Well Read, not dead. I think i would like Parchment and Old Lace. I want to read them all, but the nane just caught my attention. Love Laura Childs. Would love to win copy!! Bonus would be if it could be signed!! Merry Christmas!! I would love PARCHMENT AND OLD LACE. I so enjoy both of these authors. Caught Read Handed would be great addition to my library. PARCHMENT AND OLD LACE would be fun thank you. Would love to read them all! But Crepe Factor is top of the list. I would love, Well Read Then Dead - thanks. Read to Death is the one I would love the most. Crepe Factor please! Thanks for the wonderful giveaway! They all sound wonderful but I would love Well Read Then Dead to start with the first book in the series. It sounds delightfully cozy!! Thank you!! I have the last one but not the 1st or 2second one. I would love to be able to read all three. Keep my fingers crossed. judymckay552@yahoo.com. i loved the first one , i think i have the 2nd one (but can't remember)so i love the 3rd one "Read to Death"
Parchment and Old Lace, please. Thank you for this holiday giveaway. It is hard to choose but I would pick Well Read, Then Dead. I'd like to read Parchment and Old Lace. I would love Parchment and Old Lace. Christmas Greetings and Blessings. I would Love to win Caught Read Handed. Happy Holidays!! 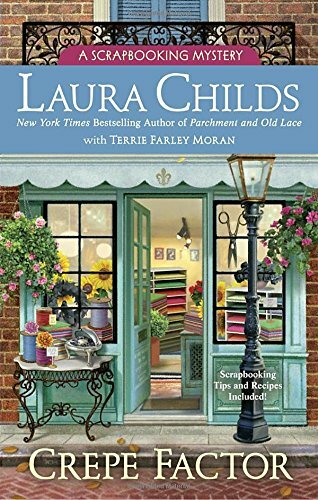 I would love to read Crepe Factor by Laura Childs. Oh what fun. I so enjoy these cozies. I would pick Parchment and Old Lace. Thanks for this opportunity. Count me in. I just finished the first book in the Read 'Em and Eat Series, so I think I'd like "Caught Read-Handed." Thank you for the opportunity. Barbara sunjester24(AT)gmail(DOT)com. Lay it on me, ladies! I am such a fan of both these authors. Lay it on me ladies! I love both of these authors. of you and your families enjoy an amazing holiday season. ll take whichever you want to send! I love the Read 'Em and Eat series! If I win I would love to have Parchment and Old Lace. Thank you for the chance to win! I would like to have Parchment and Old Lace. I recently read my first scrapbooking mystery. Thank you. Thanks so much for you participation. The giveaway is now closed, BUT, due to the huge participation and since it is the season of giving, I am delighted to announce that I will be giving away one copy of each book. Winners have been emailed and names will be announced in the sidebar. Have a joyful weekend. Love, Terrie and all the wonderful characters of the Read 'Em and Eat series and the Scrapbooking series. Not sure which book I'd choose. 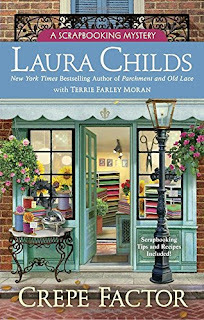 I like Laura Childs' books, though.